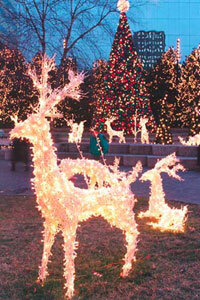 See Richmond’s Tacky Holiday Lights in Style! Experience one of Richmond’s most famous holiday traditions: The Tacky Light Tour! Every year, Richmond’s most creative residents attempt to out-do one another with blinding displays of holiday spirit. Decking their halls with thousands of holiday lights, inflatable props, and interactive displays, these homeowners create a spectacle that has become famous up and down the East Coast. This is the very Tacky Light Tour that you have seen featured on TLC! We have crafted fun Tacky Light Tour packages to include the “best of the best” of Richmond’s tackiest homes. Grab some friends and let one of our drivers take your group on a holiday lights tour that has become a Richmond tradition. We take care of the route planning and the driving, so you and your group are free to relax with drinks and holiday snacks while you take in the best that Richmond has to offer. If you would like to plan a holiday lights tour for your friends & family, as an office party, a holiday party alternative…or just for fun…contact us today! We recommend booking your group outing for the holiday season as soon as possible.